If your talking about getting your money’s worth, the show I saw last night speaks volumes. Alison Krauss and Union Station performed on August 20, 2011 at the Broward Center for the Performing Arts in Ft. Lauderdale, Florida. While they have been performing together as Union Station for 20 years, this was my first opportunity to see them at a live performance. They had played years ago at the Pompano Beach Ampitheatre but I must have been sleeping at the wheel and missed it. Not this time though. We missed the opening act, as our group had formed a consensus that eating some specialty burgers at Rok:Brgr was worth our time. It was a good decision. Yet, I heard one or two songs of the opening act and they weren’t bad. Alison Krauss continues to produce music that appeals to audiences of all ages. She has followed up “Raising Sand”, her album with Robert Plant (a 6 Grammy Award winner) with “Paper Airplane”, an album that is taking off with more potential awards awaiting her. She is a queen of Grammy Award winners, with 26 total. Her success continues with Alison Krauss and Union Station; her band of 20 years. Dan Tyminksi – Guitar, mandolin and vocalist for Alison Krauss & Union Station since 1994. He has been named “male vocalist of the year” four times by the International Bluegrass Music Association. Ron Block – Banjo, guitar and vocals for Alison Krauss and Union Station since 1991. Has written 10 songs for AKUS, of which one “A Living Prayer” received Gospel Music Association Dove Award for bluegrass song of the year in 2006. Jerry Douglas – Has played with AKUS since 1998. Is a world re-known Dobro Player who has earned 12 grammy awards, 3 CMA awards and numerous IBMA awards. He is the King of the Dobro guitar. Barry Bales – Bass and harmony vocal with AKIS since 1990. He has 13 Grammy Awards to his credit, one CMA award, one Academy of Country Music Award, and 11 IBMA awards, including Bass Player of the Year in 2008. To say that this band is tight and plays as a group is an understatement. The 20 years of performing together is evident. They blend their talents effectively together and compliment one another with harmonies and instrumental technique that far surpasses many groups. 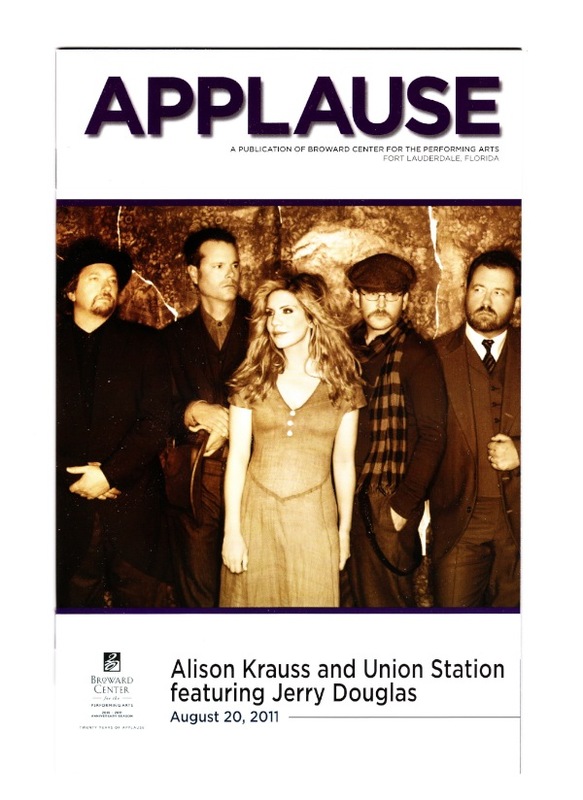 With so many awards to their credit, Alison Krauss and Union Station seem to put any potential individualistic egos aside for the group as a whole. The band simply works well together. Alison’s live voice this night was as angelic sounding, with a perfect pitch as what you would hear on any mastered CD recording. Dan Tyminski’s voice, with his pure Appalachian sound, commanded the audience’s attention. To further compliment those vocals were the tight and hard driving instrumentals and rhythm technique and harmonies of Jerry Douglas, Ron Block and Barry Bales. Close to 30 songs performed over two hours, with a solo feature that demonstrated the legendary talent of Jerry Douglas, left the audience with a good feeling at the end of the night. Alison Krauss interacted well with the audience demonstrating a confident performer with a sense of humor, as she talked about her visit to Florida and even their favorite cereal brands. While my seats were tucked away far in the second floor Mezzanine of a large auditorium, I have to say that this time I left the concert feeling even closer to Alison Krauss and Union Station. Paper Airplane, Dust Bowl Children, Choctaw Hayride, Daylight, Sinking Stone, Let Me Touch You For Awhile, Ghost In The House, Baby Now That I Found You, Rain Please Go Away, Sawing On The Strings, Wild Bill Jones, Every Time You Say Goodbye, Jerry Douglas – Medley of Shenandoah, Spain & Wabash Cannonball), (Dan Tyminski’s Banjo Solo – Green Pastures), The Boy Who Wouldn’t Hoe Corn, Dimming of the Day, Ron Block Featured Eternity, Stay, Bonita and Bill Butler, Miles To Go, Man of Constant Sorrow, Piano Blues – Any Old Time with a transition to Oh Atlanta, (Encore) – Nothing at All, Whiskey Lullaby, Down In the River to Pray, Lie Awake, Your Long Journey, There is a Reason. This entry was posted in Banjo, Fiddle, Guitar, Mandolin, News & Events, Uncategorized and tagged alison krause, alison krause and union station, barry bales, dan tyminski, jerry douglas, robert plant, ron block. Bookmark the permalink. Sounds like a great concert! I guess I was asleep at the wheel for this one. I listened to Alison Krause on her album with Robert Plant and was impressed by her. I wish I could have been there. My wife and I were also at the show and it was indeed fantastic. She is amazing at both singing and playing, and everyone in her band is playing at an incredibly high level of musicianship. My wife loves Dan Tyminski and got a big kick out of seeing him take front and center stage for a few songs. And Jerry Douglas is, well, Jerry Douglas…. In addition, the venue (The Broward Center) is really nice and there is a row of restaurants and bars next door that makes the whole evening very enjoyable. If you get prepaid parking next to the venue the whole thing is very easy, despite the drive down from PB County. We were there for the Jackson Browne show a couple of months ago.